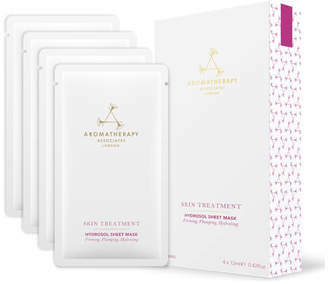 Treat your skin to the rejuvenating properties of Aromatherapy Associates Skin Treatment Hydrosol Sheet Mask , an intensely hydrating face mask made from biodegradable, non-slip lace fabric. Infused with an innovative hydro-formula, the non-drip sheet mask works to lift and firm the appearance of skin, promoting a smoother-looking complexion in just ten minutes. Hand-blended pure essential oils and powerful plumping actives deeply penetrate skin to encourage visible results, brightening and tightening to unveil youthful-looking skin. A synergy of Hyaluronic Acid and Turmeric help to improve texture and minimise the look of fine lines, while Frankincense and Rose essential oils promote a healthy, radiant glow. Adhering comfortably like a second skin, the sheet mask enables continuous delivery of ingredients into skin for maximum efficacy.